Here at “Stonewood Manor,” one of our New Year’s Resolutions is to eat healthier, as a part of larger lifestyle changes. Since the beginning of the year, my husband has been the driver of several changes in our home in support of this goal ~ healthier shopping, eating and incorporating exercise into our weekly routines. He is on it! Together, we have been finding and preparing new recipes that are free of fat and an abundance of other ingredients, and GMOs, that are not good for you. It’s been fun, the recipes good, and more importantly, better for us. The other night he shared a recipe with me for Roasted Shrimp and Garlic. It looked really good, so off to Fresh Market we went to shop for ingredients. Hubby prepared the meal when we got home, and “ya’lllllll” it was “some kinda good,” as my Grandmother would say. He also made Basmati Rice to serve with it; but when we tasted the first bite it was so good, we forgot to put the rice on our plates. 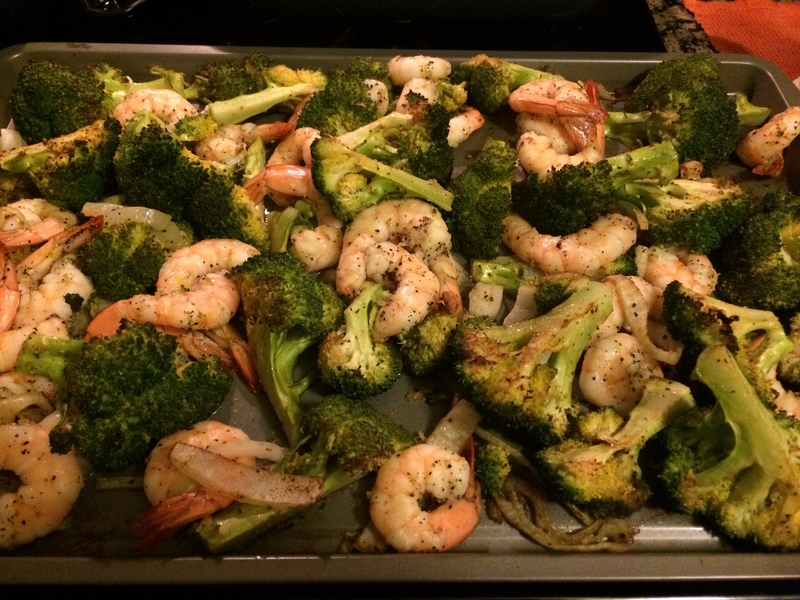 So today I share with you, “RS’s Roasted Shrimp and Broccoli.” Bon Appetite! Directions. Heat the oven to 425. On a large cookie sheet, toss together 2 pounds of broccoli cut up into florets (but not teensy tiny florets, I like a little stem attached), 2 Tbs olive oil, 1 teaspoon whole coriander seeds (or 1/2 tsp. ground), 1 teaspoon whole cumin seeds (or 1/2 tsp. ground), 1 tsp salt, 1/2 tsp pepper and 1/8th tsp hot chili powder. Spread into a single layer and pop into the oven for 10 minutes. Roast another 10 minutes, tossing once halfway through, until the broccoli is tender and golden around the edges. Enjoy! Thanks. Love the recipe part because I love to cook. Shea Webb Without God my week would be: Sinday, Mournday, Tearsday, Wasteday, Thirstday, Fightday & Shatterday. Can R share some recipes with your Dad? I would love that! This looks delish! I will try it! Thanks L. I am going to try this weekend. Two of my favorite foods!